It’s been a whirlwind month for Scugog’s new mayor but he’s looking forward to the challenges that lay ahead. It’s a new year, and Scugog township’s new Mayor is hitting the ground running. Rookie head of council Tom Rowett is enthusiastic about implementing the ideas he campaigned on. A lot of candidates bandy these terms around when they are campaigning. But when Tom Rowett says it, it rings true. No wonder that 90% of his 700 election signs were put on local lawns at his supporters’ request. No wonder he captured the coveted title of Mayor of Scugog township by almost 1,000 votes. Tom and his wife Christine personally installed his election signs. He practiced “radius campaigning,” plus he had a vibrant social media campaign. Tom got the word out, and the voters were listening. 2014 marked this hometown boy’s first municipal election. His positive attitude, intelligence and sincerity won the hearts and the votes of the local electorate. Tom officially became the Mayor of the township of Scugog on Monday, December 1. “It was surreal,” Tom says of the defining moment when he received the mayor’s chain of office. Over 200 people attended the inauguration ceremony. Members of the 2014-2018 council, which is comprised of two incumbents and five rookies, “come from all walks of life, with a great deal of background knowledge on everything from business to heritage to savvy finance to agriculture to economic development. It’s a diversified council with a good representation of the population,” Tom described. 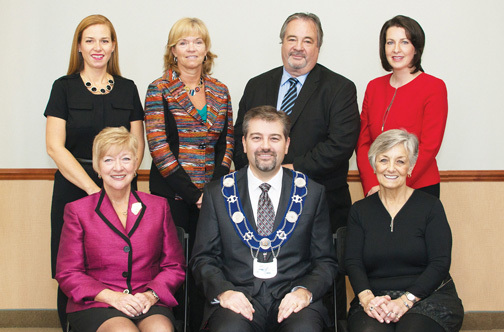 Scugog’s newly elected mayor and councillors for the 2014-2018 term of office, were sworn-in at the Inaugural Meeting held in the Blackstock Recreation Centre on December 1, 2014. Pictured in front row, from left, are: Regional Councillor Bobbie Drew, Mayor Tom Rowett and Councillor Betty Sommerville (Ward 1). Back row, from left are: Councillor Janna Guido (Ward 2), Councillor Wilma Wotten (Ward 4), Councillor Don Kett (Ward 3) and Councillor Jennifer Back (Ward 5). The first-time Mayor noted that his education and business background should serve him well in his new role. 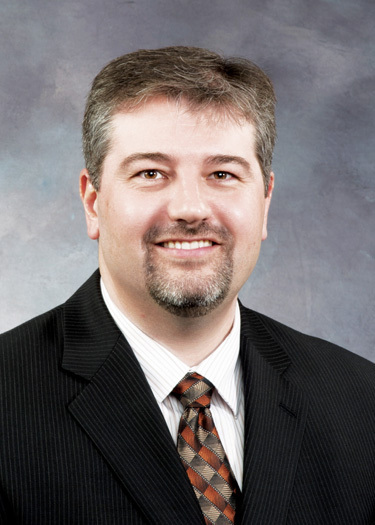 What prompted Tom Rowett to enter municipal politics? Last October, the issue of the Comprehensive Zoning Bylaw led Tom and other Scugog Chamber of Commerce members to attend some local council meetings. While there, other items on the agenda piqued his interest. “I felt the township was heading in a direction that many long-time residents and business owners viewed differently,” Tom observed. Some advised Tom to enter municipal politics as a Ward Councillor, instead of going for the top job. But his friend Janna Guido, who also resides in Ward 2, had her eye on that position. After discussions with “the pillars of the community,” Tom was “endorsed and empowered” to seek the Mayor’s chair. He “thinks outside the box” to come up with solutions. For example, the new Mayor has already initiated talks with MP Erin O’Toole regarding his unique idea for improving rural internet service, and simultaneously bringing an influx of revenue into the township. Tom plans to investigate the concept of the Region subsidizing taxi fares, which may prove to be a more cost effective way to provide public transit in the North. His research shows that replacing long buses with short buses would result in a 1/3 savings, so he’s looking into this as well. He expects “some frustration with policies and procedures,” when trying to turn his ideas into reality, but that won’t hold him back. The new Mayor advocates taking advantage of government grants, for infrastructure and other projects, but not relying on them. He also called for exploring opportunities for revenue sources and partnerships within the private sector. He’s interested in the preservation of local heritage when it adds value, but not if it’s cost-prohibitive to the taxpayers. His local roots run deep. The son of Connie Rowett and Jim Rowett, Tom was born at Port Perry Hospital. He enjoyed growing up here, living in four of the five local wards, enjoying sports on the lake and swimming at Bird’s Eye pool. There used to be a local movie theatre and a bowling alley in Port Perry too. Tom would like to encourage private sector investors to bring these attractions back, so that local youth, including his 14-year-old son Tyler, have more “non-organized” local activities. Gracing the walls of his mayoral office is an historic painting of the Old Mill, by Tom’s Uncle, the talented local artist Harvey Walker. The 2014 Christmas cards Tom sent featured the image of a painting he commissioned his uncle to do. Harvey’s rendition of the snow-kissed lakeside gazebo in Palmer Park, all decked out festively, is quite charming. What a positive way for Mayor Tom Rowett to start off his new career, by promoting a quaint landmark and a local artist in his beloved hometown, while offering season’s greetings.